Morganite and diamond pearshaped cluster ring. 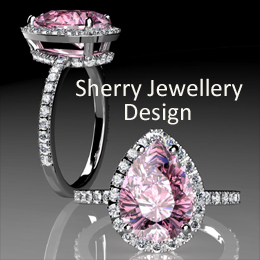 This design shows a fine, pin, pear shaped centre gem, surrounded by white diamonds. The fine, brilliants frame the morganite and are repeated, both in the under bezel and down the shoulders. The combination of pink and white gemstones are a particular favourite of mine. The colours seem to always look delicate together, creating an eye-catching prettiness that always gets compliments. We wanted to show the pear shape off to its full effect. So we set the morganite in four claws, leaving the top exposed. This way the entire outline can be seen. Invariably, pear shaped gems are ‘capped’. There is not always a good reason for this: If the stone is seated down into the rest of the design, then the point doesn’t need to be covered for its own protection.